This is an active 3D value piece from Samsung with an excellent array of features. It does not get the full benefit of all of Samsung's picture quality features but the PN64E550 does have full 1080p resolution. The up conversion processing from standard definition sources is not as crisp as it is with some of the better processing chip set TV on the market, but it's OK. The Smart Hub feature with Internet options is a new feature to this TV as well. Overall, it's a value low priced play with some extras. It doesnt have the refined looks of the best 2012 TVs, but it would have looked darn good 2 years ago when all we saw was black shiny gloss plastic bezels. These lower end Samsung plasma TVs have gotten very good-looking. The PN64E550 doesn't have the new All Black Pure Filter so it sacrifices a bit of contrast over the top tier Samsung plasmas but it still has a strong overall picture. 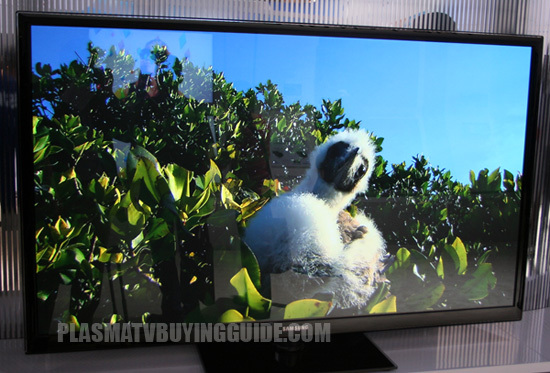 What you get with the E550 is a good picture on a value priced 3D, 1080p plasma television. Even without the All Black Pure Filter the PN64E550 has strong black levels and good contrast. Dark shadow detail is a strong point on all Samsung plasmas, in dark scenes you will not miss small details due to over powered black levels like you will in many of today's LCD and LED televisions. 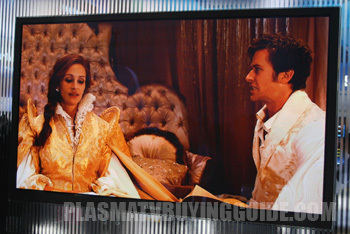 The colors on the E550 plasma look extremely realistic. In an age where many televisions are pushing color saturation over the edge, Samsung's plasma televisions continue to deliver warm and cool colors you see every day in life as well as excellent flesh tones that do not push red or blue. The E550 includes 2 pairs of Samsung's new and improved 3D glasses. The light weight glasses are far more comfortable and considerably less bulky than many active 3D glasses. The 3D performance on the PN64E550 is improved over previous years. There is plenty of depth in the highly detailed picture and there is less crosstalk an blurring when compared to older models. The PN64E550 has a 1" black plastic bezel that is covered with a clear acrylic finish, it is a good look for a value priced model. At 2.75" deep it is not a slim as many of today's televisions but it is still considerably slimmer than older plasma models. The Smart TV feature has been expanded for 2012, the E550 has access to the app store which has grown to over 1500 apps. There are apps ranging from social media to streaming video and even games you can play on your TV. Stream video from Netflix, Amazon Video on Demand, Hulu, Vudu and more. Stay updated on the latest news, financial numbers, sports scores and the weather and new for 2012 on mid tier models: surf the web on the inlcluded full web browser. The PN64E550 has built in WiFi so there is no need to run extra cable to get your plasma television on your home network. 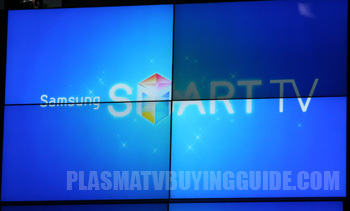 The Samsung PN64E550 is the lowest end 64 or 65 inch plasma TV on the market this year. Neither Panasonic nor LG produce one. The closest Panasonic TC-P65ST50 has a slightly better feature set and picture quality and costs $500 more. However, the PN64E550 does have a complete set of picture setting options with 2 point white balance adjustment and it comes with 2 pairs of 3D glasses - a $100 value. At $1990 it has a much better picture (in darker rooms) than the Sharp LED TVs for which the Sharp 70LE745U costs $2500 while the 60LE745U costs $1500. A pretty good LED comparison would be the LG 65LM6200 which costs more at $2300.